The recent and tragic news out of Missouri where a duck boat capsized and killed 17 is raising safety concerns for the tourist industry once again. There were 31 people on board, including 29 passengers and two crew members. Among the fatalities were 16 passengers and one crew member. The National Transportation Safety Board (NTSB) has taken point on the investigation, but the Occupational Safety and Health Administration (OSHA) is also expected to investigate since an employee was among the fatalities. “The DUKW (colloquially known as Duck) is a six-wheel-drive amphibious modification of the 2 ½ ton CCKW trucks used by the U.S. military during World War II and the Korean War.” For over 70 years, duck tours have taken place on similarly designed amphibious vehicles and offer tourist attractions in harbor, river and lake cities. Nearly 40 fatalities have occurred in duck boat incidents in the United States in the last two decades. Laws requiring the use of life jackets vary state by state, and while the use is required with recreational vessels; commercial vessels, e.g. duck boats, are exempt from requiring their passengers to wear life jackets. From an occupational safety viewpoint, job safety analyses (for jobs associated with a typical duck boat tour) would likely identify several hazards that could cause a vessel to capsize. The life-threatening result of not mitigating such hazards is drowning. As life jackets and other personal flotation devices are great examples of personal protective equipment, implementation of engineering and administrative controls is the real solution and a better one when you consider the precedence and effectiveness of hazard control. Engineering controls include designing the equipment to remove or lessen the hazard. This particular control is what many are screaming from the shores of concern. “The duck boat’s overhead canopy roof contributed to 13 fatalities in a 1999 incident in Arkansas,” according to a report by the NTSB. A re-design of duck boats seems to be a great step to implement. Administrative controls include written operating procedures, buddy systems, and training. 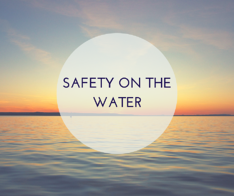 These controls in particular are easy to implement and will certainly reassure your workforce that management’s commitment to water safety will not sink to the depths of danger and despair. Before your vessel wades into the waters again, consider more than minimum compliance. Recent events demand that our aquatic leaders to improve now and our safety professionals can help. Boaters and tourists alike love adventure. Sightseeing that brings both together is an excursion filled with priceless memories. Let’s make it safer, too.